Amazon's premium ereader just got that little bit more premium: meet the Champagne Gold Amazon Kindle Oasis. With its new premium look comes a premium price tag of £259.99. In return you get 32GB of storage and Wi-Fi connectivity. There sadly doesn't appear to be an 8GB model available in gold, with the black 8GB Oasis currently costing £229.99. The Kindle Oasis boasts the biggest and highest-resolution display that Amazon has ever put on one of its ereaders, coming in at seven inches with a 300ppi pixel density. It's also IPX8 water-resistant, meaning it can survive an accidental dip in the bath or a trip to the beach. It's a bit of a shame not to see the front of the Kindle Oasis match its gold rear, but the hope is that Amazon will release a colour-matched case alongside it – although that'll likely be an additional cost. 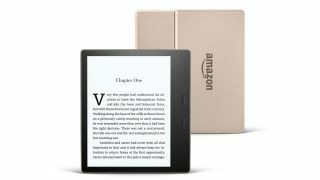 The Amazon Kindle Oasis is available to pre-order from today, and will go on sale officially and land on doorsteps from March 22.